Every day for the last 14 years, Spouse and I methodically perform a daily ritual known as “coffee talk.” Coffee talk obviously derives its name from the ritualistic consumption of the caffeinated beverage which enables each member to hoist his or herself out of bed, but a more imperative objective of this communion involves the quotidian need to plan that day’s formula for exhausting the Offspring. 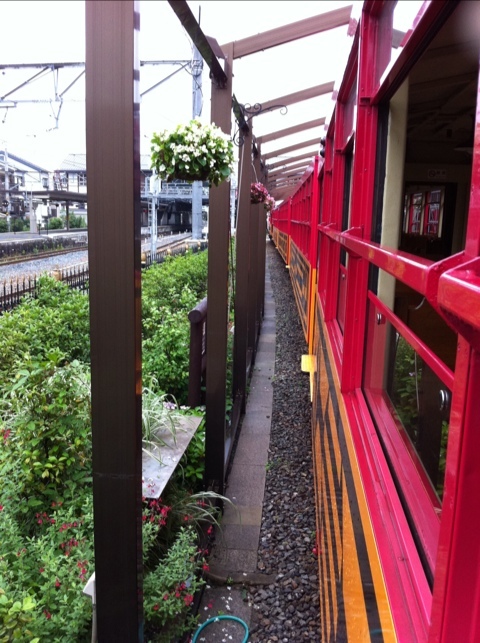 Spouse and I were delighted with Tuesday’s plan for pooping them out by cavorting through scenic Kyoto via the Romance Train followed by hurdling down the Hozu-gawa river in a boat. We failed to consider the possibility of killing Grandmama in the process. On Tuesday, we headed West to Kyoto. (For background on Kyoto read here) Carefully plan the trip to Kyoto or risk a tragic final vision of this historic town- face down in a Zen rock garden, choking on incense having overdosed on Temples all the while begging Buddhist monks for french fries and a fully loaded Coke. Then again, it could be we Clampitts have a limited appetite for cultural displays and short attention spans. After Grandmama’s inaugural ride on the bullet train, we spent the night in a traditional Japanese Ryokan (Hotel) on rows of futons in the single room allotted to our group. 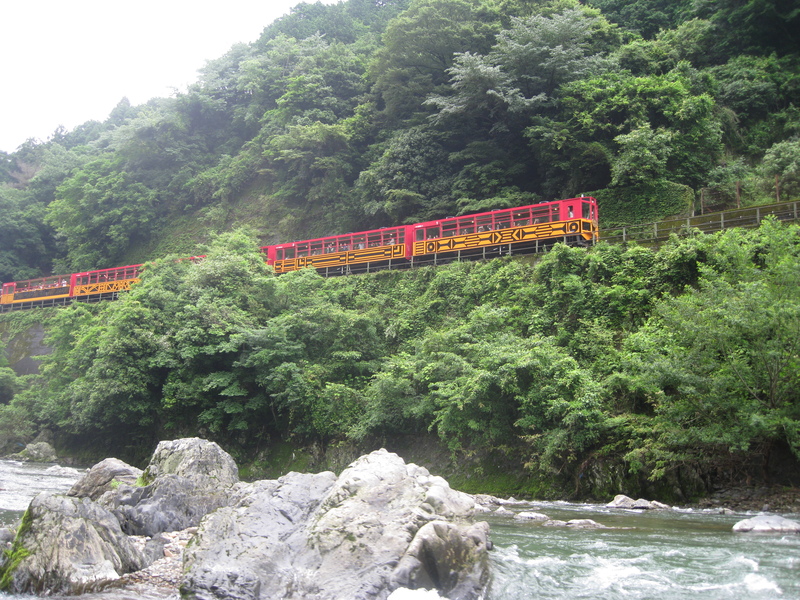 The Offspring and I passed around the pamphlets for the “Sagano Romantic Train,” and “The Hozu-gawa River Tour,” and tucked in anticipating the fun ahead. Grandmama was asleep before the pamphlets were returned to the backpack. Almost immediately the most horrific noise produced by a human being commenced. Although technically defined as snoring, this combination of whistles, snorts, grunts, and the cacophony of other sounds emanating from the nasal cavities and mouth area must have another more serious medical definition which described the din we suffered through out the night. Occasionally sleep would overtake one of us until one of her rousing trumpet blasts would jolt us all awake. The next morning we pulled ourselves hand over hand up the railing to the train. A well rested Grandmama hopped on as if assisted by a pair of giant wings. No other sleep deprived tourists broke Ouisar-san’s Number 1 rule for traveling. Because all of you have been so supportive of the many foibles I’ve shared over the last several months, I’ll share my Number 1 Rule of Traveling and most secret of secrets: Always get to the park/train/boat when it opens because everyone else is just too dang lazy to be the first in line. As usual, my secret of secrets worked like a charm-we caught the first ride out at 9:07- which allowed us full access to all of the primo picture-taking spots, some blessed by the conductor, others cursed. OK- this wasn't taken from the train, but is a great picture OF the train. Along the way the conductor stopped for picture-taking. This, in the conductor’s mind, was a great photo-op, so I sprinted to the middle of the train to get this National Geographic photo moment. It was a competition after all. With the right adjustments, these will probably pass as an authentic Black Bear family from Yosemite National Park. I kept expecting a rousing rendition of “Song of the South” from Splash Mountain at Disneyland as I looked at this family. Can someone remind exactly who these guys really are? “Mom….” She was very worried. It’s really important to seize these opportunities when presented as they don’t come along that often. Grandmama gave me the Thin Lips indicating motherly disapproval. After 30 minutes on the train the terrain flattened. The ride ended when the rice farms appeared. The boat had three men- pushing, steering and rowing. The man in the back controlled the rudder, one in the front rowed, the other in the front ran a long pole along the bottom of the river. 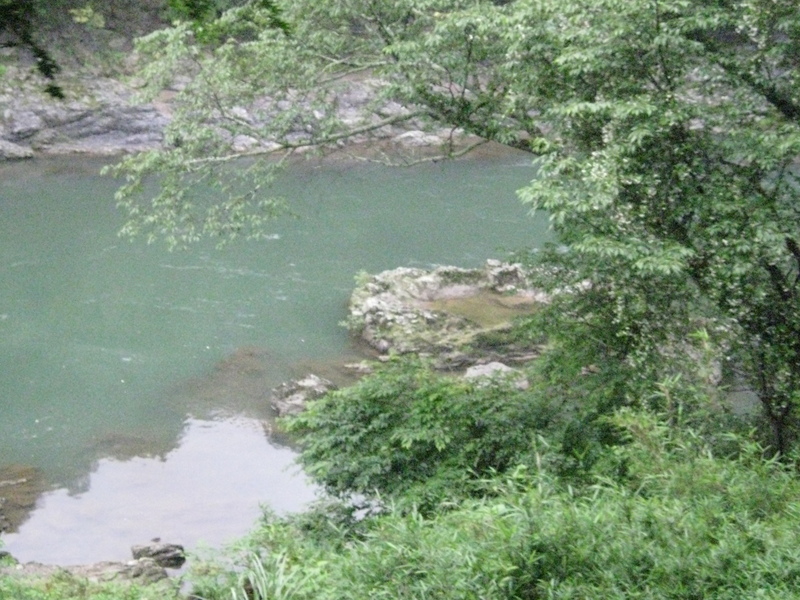 He placed the pole on the river bottom and would then run from the front of the boat to the mid portion pushing the boat along the bottom as he ran. Every so often the men would rotate positions. 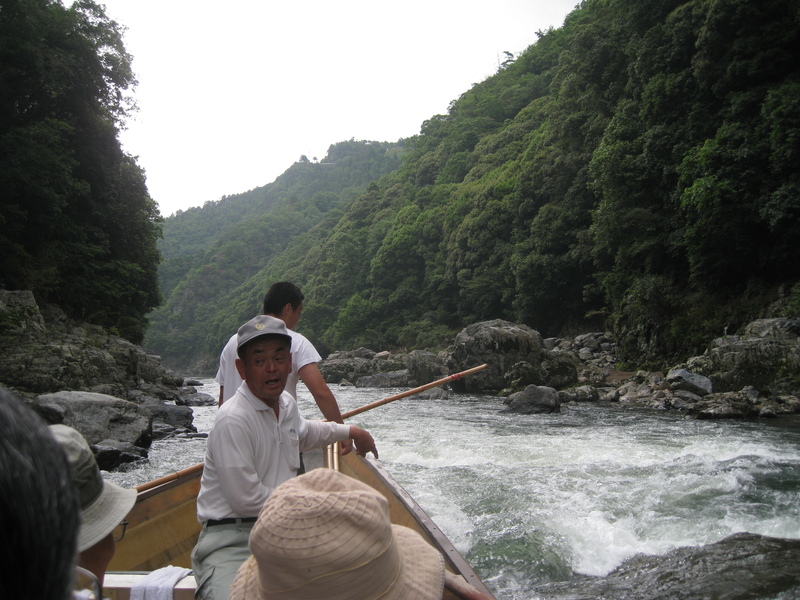 The river has been navigated by this type of boat for centuries. 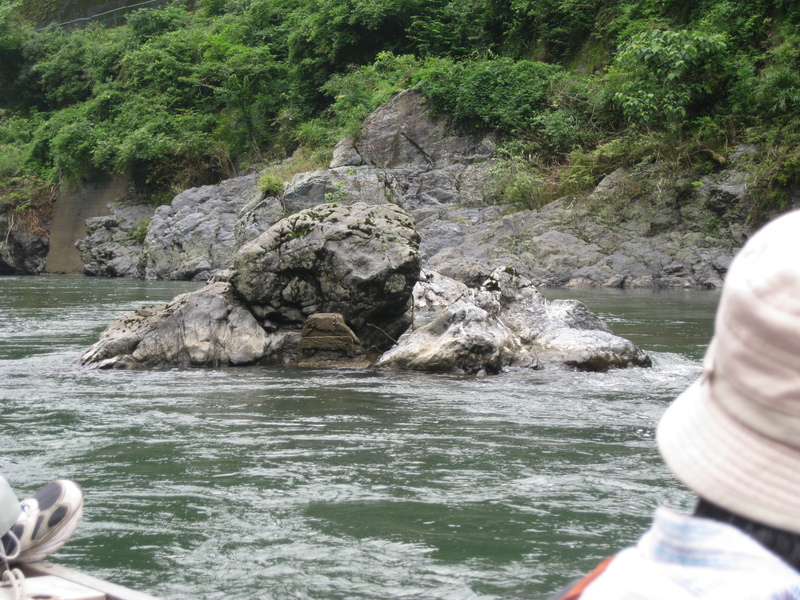 The rocks bare holes from the poles placement to steer the boats away from the rocks when going through the rapids. There were several items of interest not covered on the official brochure- like the triangular concrete doodads below. 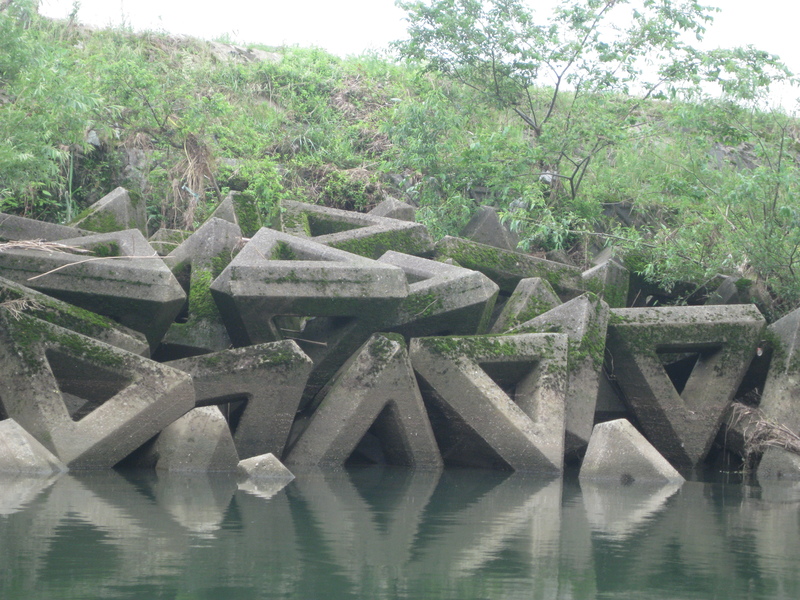 These are used all over Japan to prevent erosion of coastal areas as they act like sand dunes. The captain (seated) entertained the entire crowd for two solid hours with a constant banter that rocked the boat with laughter. We didn’t speak enough Japanese to understand his jokes which not deter him in the least- he splashed us with water to keep us with him. The deck hand took the river more seriously and was often on the receiving end of the Captain’s jokes. 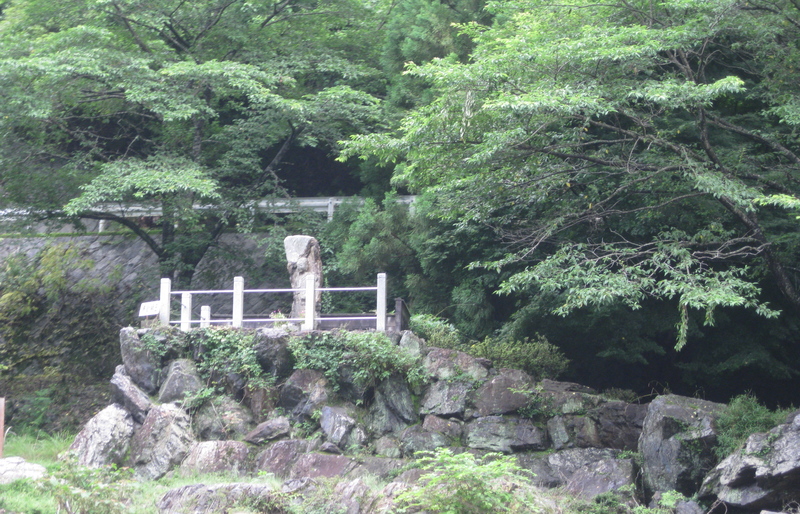 The spot below now occupied by a lone fisherman was reserved for Emperors and Shoguns throughout previous centuries. Lucky. 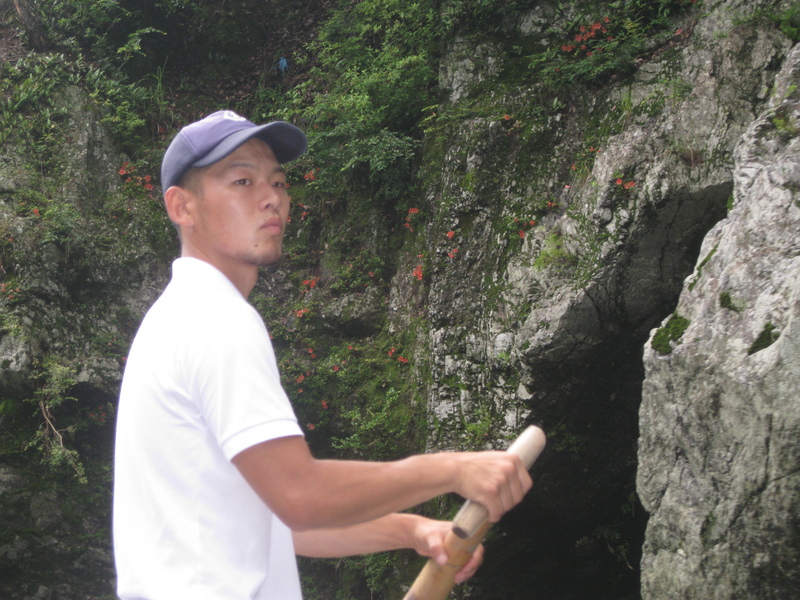 Although I think he’s either a plant from “Visit Japan” or just learning as only a novice would abandon a baited hook unless retrieving a beer from the cooler. 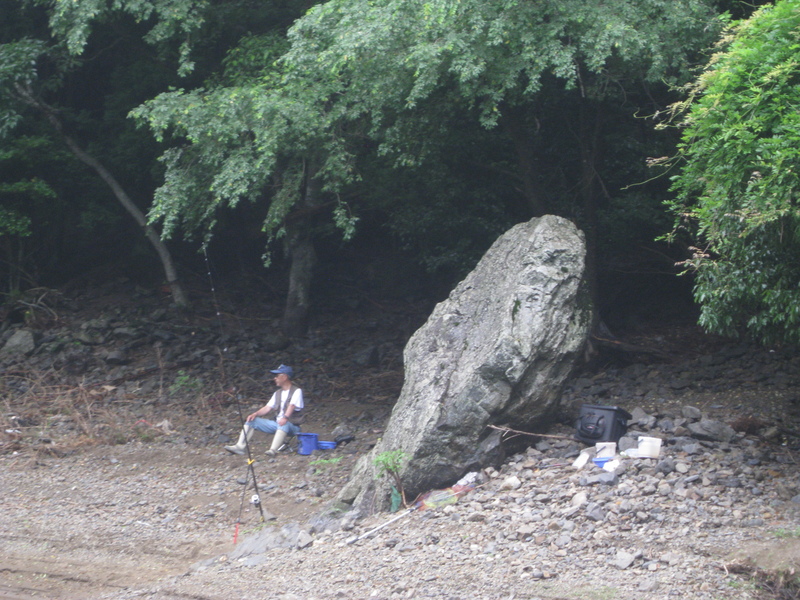 Lion’s rock is pictured below- the head is looking at you. It wouldn’t be Kyoto without a Buddha sighting. The Clampitts will be going down the river in this ride next time. 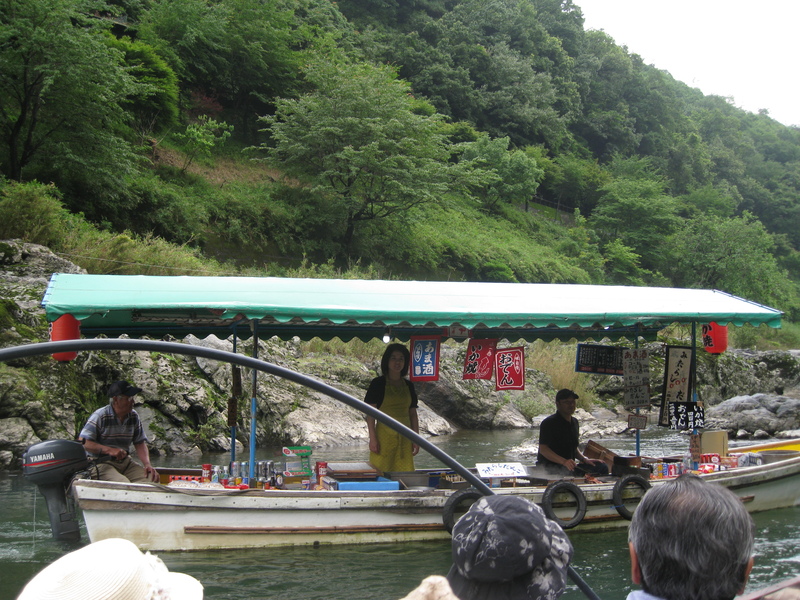 Toward the end of our trip a floating “conbini”- convenience store- pulled up. Just in time. The Offspring and Grandmama were famished from the hour and half journey down the river. 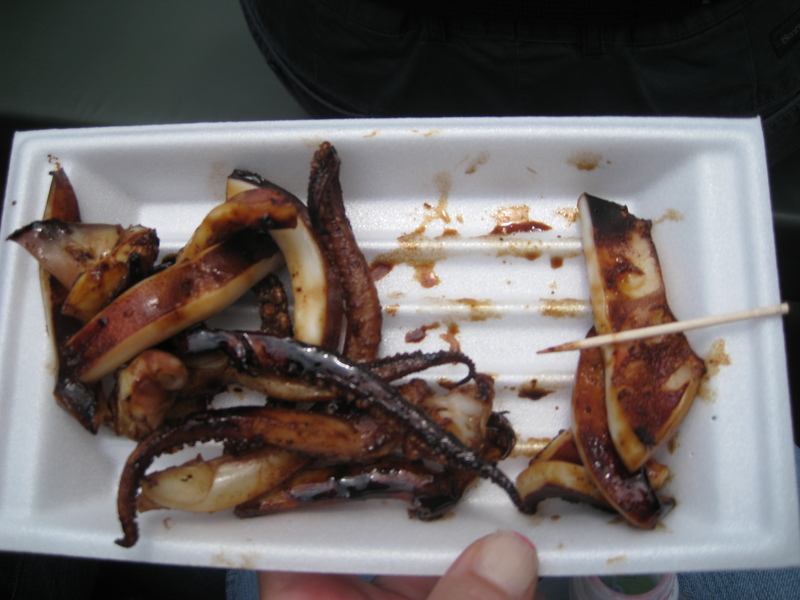 All noses pointed toward the grill master on the conbini boat. At that point, we would have eaten anything- and we did. It was fantastic and all over my shirt by the time we hit the dock. We hadn’t killed Grandmama yet, but it was only 12:00 when we got off the boat. We still had the whole day left. 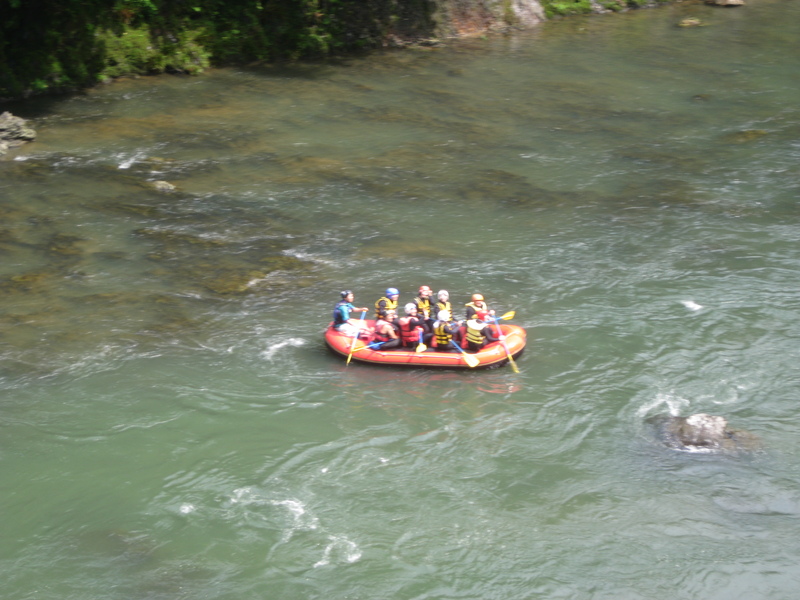 This entry was posted in Moving to Japan and tagged Amblerangel, Children, Culture, Emily Cannell, ExPat, Family, food, Grandmama, Hey From Japan- Notes on Moving, Hozu-gawa River, Japan, Kyoto, Moving, Offspring, parenting, Romance Train, Ryokan, Tokyo, Travel, Vacation. Bookmark the permalink. I should have stayed in Japan this summer and let you be our tour guide! Wow, that sounds and looks like a fabulous trip. Glad Grandmama survived. It was lots of fun- we went to Kabuki last night- LOTS of fun! Yay! I hope you blog about it. I will- it was a BLAST!!! I love it and so did the rest of the Clampitts- we left at hour 3 though. I will be emailing you some questions- would you mind doing an “interview” as part of the post for that? I stopped reading about two sentences in and grabbed a cup of coffee. I then had a very relaxing time reading your blog, laughing out loud and sipping my coffee. I subscribed to your blog because I used to live in Tokyo (many moons ago) and thought it would be nostalgic. Little did I know I was getting some great writing and hilarious stories. Can’t wait to read about the second half of the day. Why thank you for the kind words! You have to let me know where your favorite spots were when you lived here- we’re still making the list up! I was SO glad to see that thing! I would’ve chewed on the side of the boat at that point…. Those critters lined up on the platform (?) 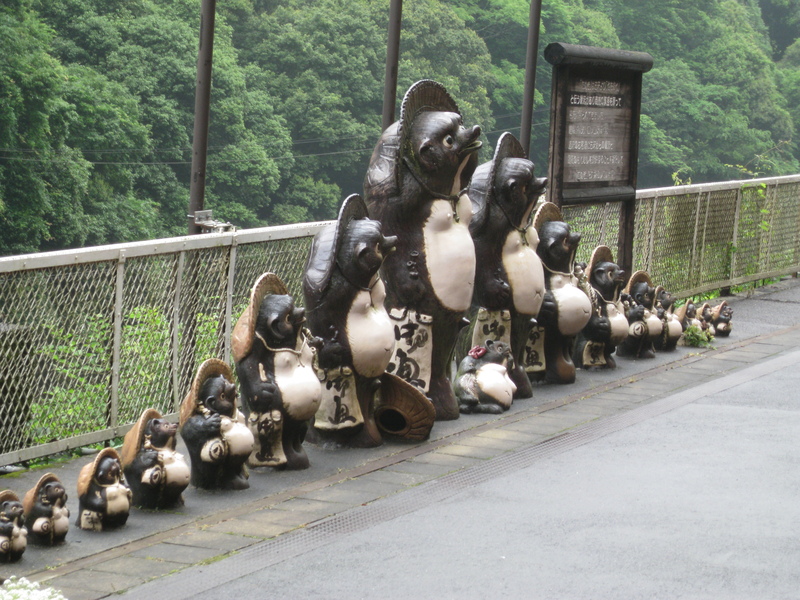 are tanuki, or badgers. You’ve probably seen their statues everywhere because they represent good luck and fertility—notice they usually have huge testicles that droop onto the floor? I think their real-life counterpart, the badger dog, is common in the woods out there, but they don’t normally stand upright with a barrel of sake while wearing a straw hat. That would be scary. Thanks Hangaku Gozen! I knew I’d recognize the name- I’ll definitely have to take a closer look next time I see one…. I actually didn’t know there was a live version. 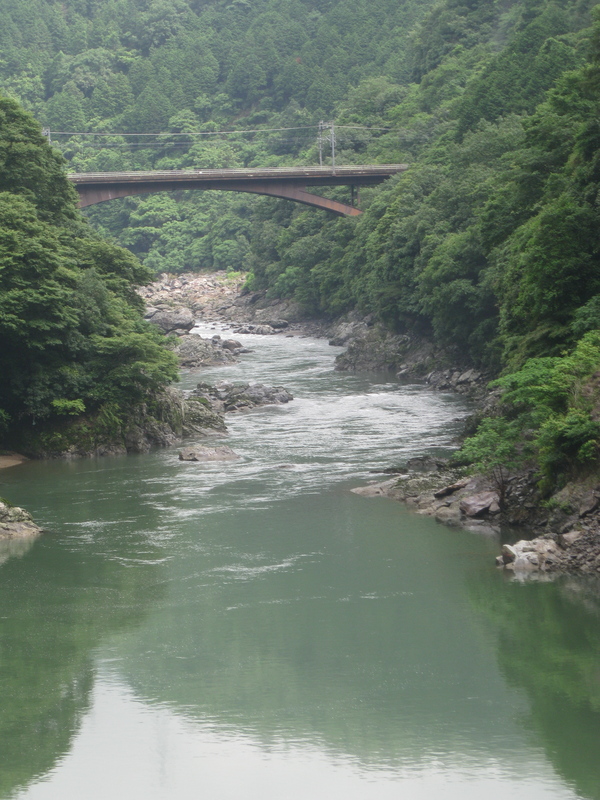 OK that is seriously cool, I had no idea that they had rivers like that In Japan. Such lush scenery as you pass through those forests. My camera just did not do it justice. It was really beautiful. Kyoto is one of the most beautiful places I’ve ever been- Banff is the other. So glad you got a good night’s sleep before your big day! And thank God you didn’t kill thin lips! Looks like a fun trip! 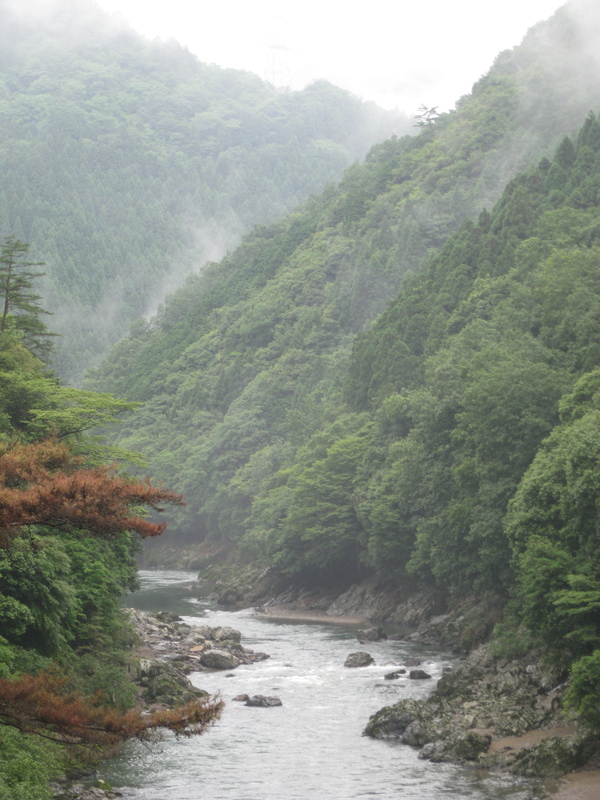 I really like the photos taken from the train -especially the one of the river winding through the mountains with the mist over the trees. Looking at the vegetation you can really see where the Japanese style of painting originated. I took some pics of the trees up close- the conifers have white trunks ending in the pointed tops- there you really see the origination of the sumi-e painting but the pictures were really faded out so I didn’t post. Am sending a few of interest to you I shot the other day in Yokohama China town….. 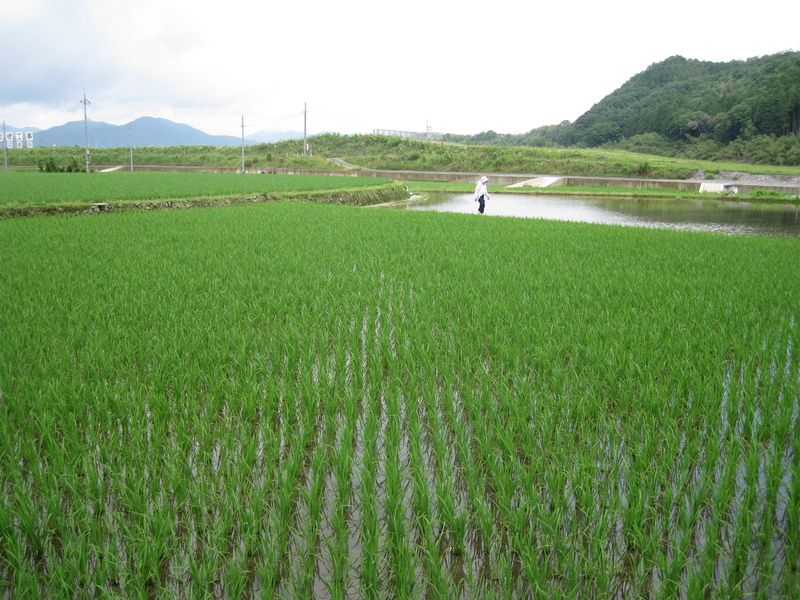 Loved the shot of the rice farm – so lush and green. Thanks for taking us along. Can’t wait to see what’s next up your sleeve. I really took it from a bad angle- a result of the slow translation process between my brain and ears. Jacque- that was only the first half day- I’ve got 2 more weeks to bore you with! Ahh Tori…. we’d still bring you along because just like Thin Lips- you’re lots of fun! Great post..again! I featured this post on one I did today on Headlines! I wandered over here from Bridgesburning. Wow, am I ever glad I did. love your style and looking forward to following along – from a distance!! Thanks! I’m so glad you did- I love the Bridges Burning! Hi, I’m another refugee (is that the right word or is Chris going to kill me??) from Bridges Burning and very happy to be here. Your trip looks wonderful. 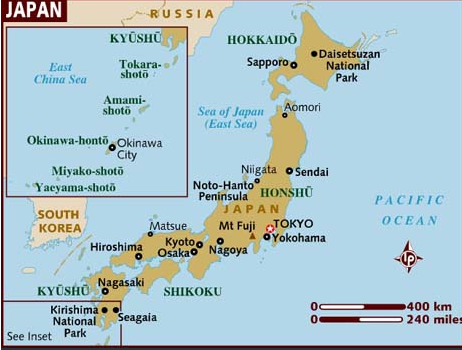 Funny how all we usually see of Japan is cities and neon. Beautiful pictures! I can so empathise with entertaining the crinklies – we took my mother wadi bashing once, I think she’s just about forgiven me! This Gramma snores too…my family hates being in a hotel room with me! 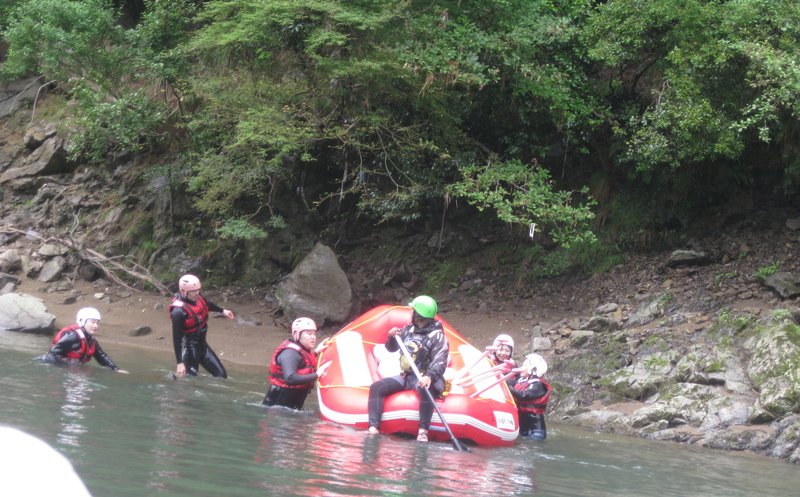 Love the photos…glad Grandmama survived the boat ride! I ALWAYS travel with ear plugs- just to tune my own kids out- and this time I didn’t . Believe me, toilet paper doesn’t suffice! I’m glad you also sleep soundly Wendy….